Wave your Wiimotes in the air like you just don't care. The Legend of Zelda: Skyward Sword could be heading to Nintendo Switch, according to multiple concert-goers. Series producer Eiji Aonuma reportedly teased fans about a potential port/remaster yesterday during The Legend of Zelda concert in Osaka. It’s not everyday that you head to a music gig and leave with the latest Zelda rumours, but apparently in the world of Nintendo anything can happen. According to multiple attendees on social media, Eiji Aonuma appeared as a surprise guest during the concert and teased a potential Skyward Sword Switch release. I know what you’re waiting for – Skyward Sword for Switch. Right? Whether or not this statement holds significant weight is debatable. However, it would be somewhat careless for a producer to tease a game directly to the series’ fan-base without having anything in the pipeline. 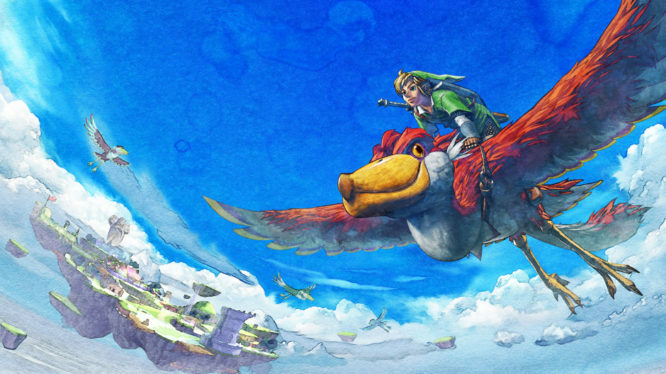 Considering Wind Waker and Twilight Princess have seen HD remakes in the past, Skyward Sword would most definitely be next in line if Nintendo wanted to continue this trend. Interestingly, Skyward Sword was also one of the three Zelda titles to have its models tested in the new development environment. Takizawa revealed during GDC 2017 that assets from Wind Waker, Twilight Princess and Skyward Sword had all been used to create HD mock-ups when considering future art styles. These HD mock-ups have previously lead to remastered releases, with the development team even stating that Wind Waker HD’s release was a result of this experimentation. Now with only Skyward Sword left on the table, if Nintendo needed to buy some more development time before the next new Zelda title, a Skyward Sword HD release would certainly be an option. Until we get an official announcement from Nintendo, Skyward Sword HD for Switch will still remain rumour and speculation. However, given the recent signs, it’s definitely not one I’d personally rule out.